If you have a Netflix account, you’ve probably seen the trailer for The Little Prince recently. It looked so adorable that I wanted to watch it and since one does not simply watch the movie first… I had to read it of course. A pilot who unfortunately has grown up crash lands in the middle of the desert. There he meets a little boy from another planet. The boy tells the story of how he fled his planet because of his love for a rose. In telling his story, the little boy reminds the pilot of the magic of seeing the world through a child’s eyes and the dangers of losing that magic when you grow up. So I really loved this book. The entire book was just whimsical and magical. I love how even though the pilot is a grown up, he remembers the feeling of drawing a picture that the adults just didn’t understand and the feeling has stayed with him. When he meets the little prince, he meets a child who understands perfectly. The pilot is an adult who hasn’t fallen into one of the typical categories that other adults in the story have. 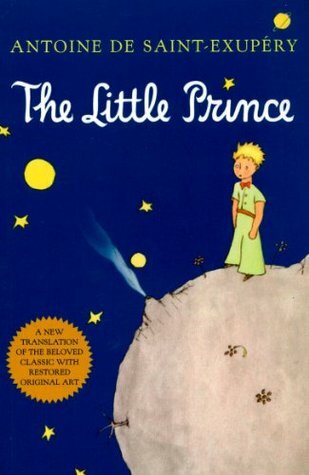 The little prince is just charming and I fell in love with him as a character. He lives alone on his planet and his only friend on his planet is a single rose. After having a disagreement with his rose, he leaves his planet and passes through many other planets. On each planet is a single adult and I loved how each of them embodied a different adult characteristic that children just don’t understand. For instance, he meets one man on a planet who spends all day and all night counting the stars because he “owns them”. When the little prince asks why he needs to count them, the man informs him that it is very important to calculate numbers so he can own more. Another man on another planet spends all his time preening and looking for someone to admire his clothes. It is a little difficult to put into words all the things I loved about this book, but I loved both the pilot and the little prince. The love the prince had for his rose was very sweet. I would definitely recommend this book to children and adults. This was one of the few books in recent months that I’ve given 5 stars. Having heard so many things about this novel, I have been wanting to read it for over a year. So I borrowed it from the library and attempted to dive in. I quickly realized that this was a book I wanted to take my sweet time with and so I returned it and bought my own copy. Walter Moody, a young Scottish lawyer, arrives in a gold mining town in 1866 New Zealand on a stormy night. He walks into a lounge at his hotel and disturbs… something. Inside the room are 12 men of different races and different walks of life discussing a series of mysterious events that occurred on the same day two weeks prior. A man is found dead, a prostitute is found collapsed in the street and a rich man goes missing. When it is discovered that Moody has a slight connection to the events in question, they take him into their confidence and attempt to figure out what happened. Where to even begin? The book was written in the style of a Victorian novel which I really really enjoyed. It was done so well that I could really have believed it was a Victorian novel. The structure of the novel was great. Basically the first 300 something pages were dedicated to that night in the hotel lounge learning of the mysterious events that had taken place two weeks prior. The whole rest of the novel takes place afterwards. The book is divided into 12 parts and sections with a different character the focus of each. At the beginning of each “part” there is a kind of zodiac chart that I’m afraid was lost on me but I did not find it necessary to the story. Though I did notice that the parts of the story “waned” like the moon. (Though I mean to look into it in further depth and maybe come back and amend this review) As we see a little bit more into each character’s life, a little bit of the truth is revealed, piece by piece. It was wonderfully done in my opinion. For a book this large – all 832 pages of it- it never dragged. Every page was necessary to the story. Catton’s choice of setting was spot on and she managed to bring an 1860’s goldmining town to life. She also focuses attention on the opium trade and the life of Chinese workers in a mining encampment. I should also point out that I have never read a book with such a well crafted cast of characters. Before this, I had considered Agatha Christie’s Murder on the Orient Express unique for its large cast of interesting characters. Until now. There were TWENTY main characters in this book. TWENTY. I have read books with only a handful of characters that the author still manages to make flat. 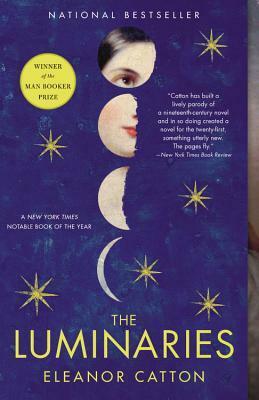 I guess with an 800 page book, it’s kind of hard not to get to know the characters but Eleanor Catton managed to create 20 well rounded characters and every single one of them was integral to the story. I guess to sum it up I’d say that there is a reason why this book won the Man Booker Prize. I thought it was a really remarkable book. I loved the writing, the structure, the characters, and the plot. I highly recommend this book and I hope people are not turned off by the size. I don’t often give 5 stars but this book I gave 5 stars, hearts, or whatever unit of measurement we are using these days. If you have read this book, please tell me your thoughts. I’m dying to discuss this one with someone!